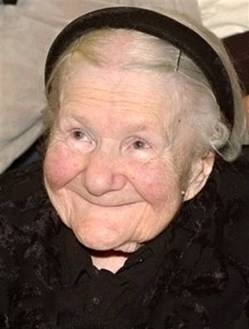 During World War II, in a Warsaw ghetto, Irena Sendler carried infants out to safety in the bottom of her tool box. She also carried in her truck a sack for larger children. She trained her dog to bark when Nazi soldiers let her in & out of the ghetto. Soldiers wanted nothing to do with the dog & the barking covered the kids noises. It is estimated that Irena saved over 2,500 children. At one point she was caught by the Nazis and they broke her legs & arms during torture. She also hid the names of the children in jars so they could reunite with parents. “She was the inspiration and the prime mover for the whole network that saved those 2,500 Jewish children,” Debórah Dwork, the Rose professor of Holocaust history at Clark University in Massachusetts, said. Irena passed away at the age of 98. Next Post: Two Awesome Guys! She truly looks like an angel. What love for her fellow humans. One determined person. All it took to make a difference in the lives of 2500 children and all their families. It only took one, with a little help from a dog. Never ever underestimate the power that you have or the difference you can make. WOW!! A GREAT story that you simply HAVE TO READ!!! Truly an angel resting now in the arms of Jesus. Thank you for sharing this special story. Skye. Than you SO much!! have an AWESOME day my friend!! Touching. God Blessed. There lies Humanity.